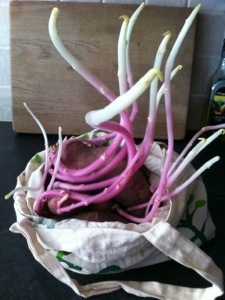 I just went under the stairs to check some spuds I’d forgotten about. As they are a bit spindly, you could bury them deeper,or put them in a tall container and cover well!! These were supposed to be ones for eating not growing!! Forgot all about them. I have new ones chitting so I think I’ll just throw these out.